← Suntory Kinmugi Spring 2012: For the beer drinking densha otoko. 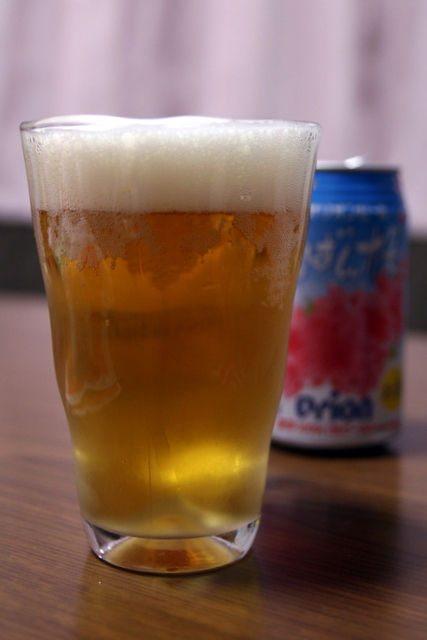 A subsidiary of Asahi, Orion Beer hails from Okinawa and produces the only major Japanese beer available in the US that is still made in Japan. 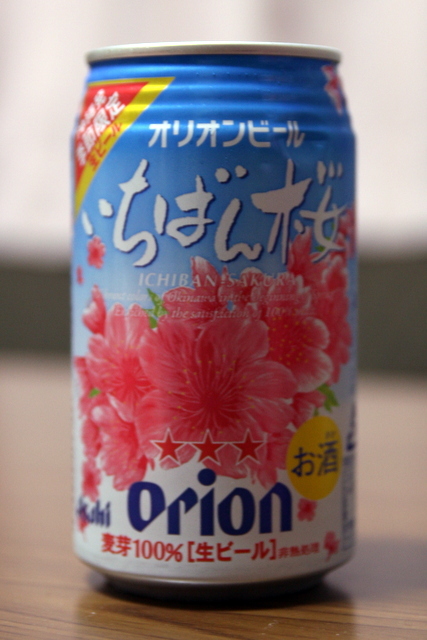 Around the end of each winter, Orion releases a limited production all-malt beer to celebrate the blooming cherry blossoms, that bloom early in Okinawa’s warm climate. Orion Ichiban Sakura poured out of the can is fairly light in color, a standard straw you’d expect from a lager, and the malt is apparent in its aroma. In line with the color, the flavor is actually quite light on the front. The malt and hops come through on the back of the tongue, with a slight tartness and bitterness. This beer is quite difficult to find, at least in my area, and I was lucky to pull the last one off the shelf of a large liquor store in my area. I’ve been wanting to post Ichiban Sakura for a couple years now, but this was the first time I’ve seen it in the store since trying it in Hiroshima. I’m sure it’ll be next to impossible to find right now, but come next year be sure to pick it up if you see it. This entry was posted in Japanese Beer and tagged all malt beer, Asahi, Japanese beer, limited edition, Limited Production, Orion, seasonal, spring. Bookmark the permalink. At least as far as Asahi goes I’ve discovered it’s not too hard to get the Japanese version in the US: you just look for the tallboys or the 32-ounce cans, which are inevitably brewed in Japan. Yebisu is also always imported but that’s much harder to get outside of restaurants. I did here once that Asahi sold the Japanese import in the US, but I was never able to find it. I’ll be on the lookout the next time I’m in the US. Yeah, at the very least you should find the 32-ouncer somewhere. In New York I’ve found it most often in Korean-owned delis. New York has everything! I’ll be on the lookout the next time I’m there… hopefully sooner than later! I thought something was different! My wife was drinking this and I had a few sips. She told me it was just regular Orion with a different design on the can. I kept saying it tasted better than regular Orion. The tartness and bitterness was quite nice on this.